This year, the College Football Playoff Committee have caused this season to be an emotional roller coaster to a lot of fans. You never know where any specific University will end up due to the inconsistency of the inaugural College Football Playoff Committee. Each week the criteria for a team to stay in the Top 4 Playoff Spots changes. Nothing has remained the same. They have no transparency or concrete facts as to why they have placed certain teams in each spot. During the BCS Era, everyone complained about it, but I am willing to bet that due to the headache the committee has caused, the return of the system would be a welcomed site. Was the BCS system perfect, NO, but it was a lot better than what the committee has come up with. Yes, the BCS and individuals working with it, favored certain conferences over others, but it was easier to deal with than what the committee vomits each week. I know a lot of you are asking yourself, “Why in the world is he complaining, Alabama is #1.” I’m not complaining, but do you actually think it’s fair for an undefeated FSU team be placed at the #3 spot over a one loss Alabama and Oregon? Does that make any logical sense? You would think that because FSU is undefeated, no matter how they won their games, they would hold that Top spot with no questions asked, but it’s far from that way. The committee seems to forget that a win is a win is a win. Whether it be by 1 point or 30. There wasn’t a real concrete ranking until October 15. Yes, the committee said that they were not using or taking into account the AP Top 25, Coaches Poll, etc., but that’s not true. Their first honest ranking didn’t happen until October. Here is what they have based their rankings on: Game control, Body of work, Top 25 wins and what their opponent was ranked when they played said opponent. You’re looking at that and saying how it is not fair? The criteria they are basing each team upon is fine. Each of the topics were for a specific week; not all the criteria was used at the same time. Example: This week they were taking into account what a team was ranked when they played their opponent. So if you played Ohio State at the beginning of the season and they were ranked #4 and now they are ranked #6 that takes away from your argument to stay in one of the Top 4 spots. Should that matter, NO, because when you played them, they were ranked in the Top 4, that win should hold the same weight when you beat them all the way until the completion of the season. 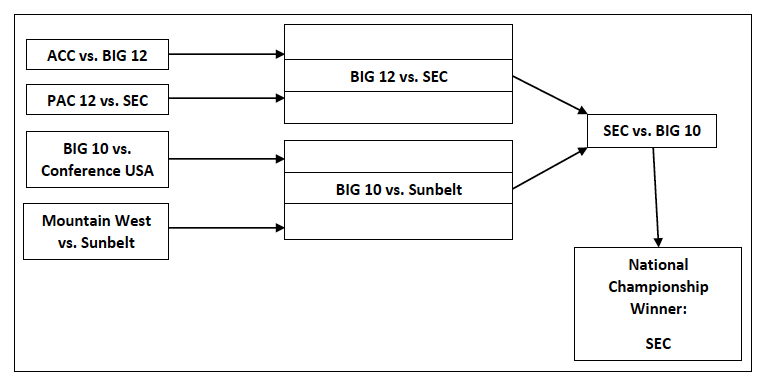 This system will consist of the Top 8 Conferences in College Football. The FBS Power 5 Conferences would have automatic bids. The remaining 3 slots to finish out the 8 would be selected from the remaining FBS conferences based on their Conference Power Index which will be based on the schedules of the teams in those respective conferences as well as records of the respective Conference Champions. The three teams that meet this criteria would make up spots 6, 7 and 8. •	Teams would have to play 10 Conference Games (this would eliminate a lot of the out of conference play; mainly for the teams that like to play tune-up games instead of playing within their respective conference). •	Game 11 would be the Conference Championship Game. •	Game 12 would be a lottery draw of conference champions to play each other. This would be considered Bracket 1. This Bracket would consist of 8 Conference Champions. •	Game 12 (Bracket 2) would be the winners from Bracket 1, which will consist of the 4 winners from Bracket 1. •	The winners of Bracket 2, the two winners, would then play for the National Championship. Of course, it wouldn’t suit everyone, but this is a whole lot better than what is currently going on with the committee of “intelligent” individuals. I hope for the sake of all college football fans that the committee works out the bugs before the end of the season. Next year, we shouldn’t have many headaches such as this year. If you feel that you can come up with a better option, I challenge you to do so. We all have complaints and will complain, but won’t provide a possible solution. Instead they would rather complain with the rest of the crowd. Today was an awesome day. I know that I was putting together Words of Wisdom by Sheezy, Part 2, it’s still a work in progress, but I would like to share a special moment that I had today with all of you. Today, my family and I went to a certain city here in Georgia and went on boat ride about this city and awesome facts about this place. Well, I was talking to this older couple on the boat; regular conversation, where you from, all that good stuff. Of Course I was repping my state with my Alabama hat and this older gentleman asked me if I was from Alabama? I said, Roll Tide! (That means yes in Alabamian) He asked what brought my family and I to this area? I told him that I was active duty military, but I was medically retired because of some injuries I sustained while deployed. The boat ride was a little over an hour. We came back to the dock, I gave the hostess a tip and me and the family went to our favorite restaurant, which is TOP SECRET and will not be disclosed in this format. The older gentleman walked in behind us and asked if we were going to be eating some lunch and we all in unison said Yes! The next thing he did, I could not believe. I’ve had it happen to me, by myself, but not with my family. This gentleman and his wife said, that we had to let them pay for our lunch. I said, no I can’t let you do that. He then said that’s the least he could do for a fellow Veteran. We ordered our food, but while we were waiting for our food, the couple had already gotten their food and was about to leave. He walked over to me and said, Thank You for your service and sacrifice for this country. I told him, that I was only doing what I felt was the right thing to do. Before he walked off, I asked if I could have his email address so that we could keep in touch. He was a little shocked because he didn’t think that I would be interested in to talking to an older couple. He then said to me that he fought in Vietnam and that the welcome he received when he returned to this great country of ours, was not what he thought a person that did what he did and see what he saw should receive. As he was saying this he started to get choked up. I then told him, Thank You for your service and that he did what he thought what was right; I also told him that he wasn’t the one that volunteered to go and fight. His country called and he answered. I’ve had numerous people come up to me and say, Thanks for my service, but this time, it was different. It felt different. To have a Vietnam Vet say to me Thank You for your service, knowing that he didn’t get that same welcome humbled me. I was speechless. When I reached out to shake his hand it was almost like I felt the same pain that he felt when he came back from Vietnam. I took down his email address and I am going to do all I can to keep in touch with he and his wife. I don’t know if any of you understand what I am talking about, but it’s a very humbling experience. I felt this same way when I was chosen to jump into Normandy on the 65th Anniversary of D-Day. Being able to walk on the same beaches that many men paid the ultimate sacrifice, touch the water, having the opportunity to have a moment of silence to myself and let the water touch my boots that was filled the blood, sweat and tears of men that didn’t know that that day would be their last, is a feeling that many will never understand. It doesn’t matter what era you fought, whether you were a soldier, sailor, marine or airmen, a special bond is shared. I hope for the sake of the people that actually read my Blog posts understands where I am coming from and understand that if I was all over the place, that it wasn’t meant to be that way. I just let my fingers type what I was feeling. Today was a great day. My lovely wife let me watch football without any interruptions. We had planned on going to get some sushi, but we both took a nap. She wanted to leave the house about 4, but that’s when we woke up. At this point the game had already started. I turned it on and was watching it as I was getting ready to leave and my wife says to me, “You stay here and watch the game.” I said no, I don’t want you to think that I am putting a football game before my family. She insisted that I stay and watch the game. I have an awesome wife. She knows how much I love College Football. For you that don’t already know that my team is the Alabama Crimson Tide, I mean it’s an obvious choice because I am from the great state of Alabama. Yes, we have this other, sub-par team called the Auburn Tigers, this is just my opinion, but watching the Auburn Tigers play is like watching paint dry. I know that’s harsh, but I am a die-hard Alabama Crimson Tide fan. Today we defeated the Texas A&M Aggies. The score was Alabama-49, Texas A&M-42. This game was important to me because last year, their first year in the Southeastern Conference (SEC), they beat us at home. I was pretty upset about it, but I quickly got over it, because we made it to the BCS Championship Game, defeating Notre Dame. My bitterness towards the Aggies is all because of their quarterback, Johnny “Football” Manziel. The reason why I’m bitter is because this guy is an awesome quarterback. He can make a play out of no play. Watching the Aggies play other teams I can stomach the game, but when its time for them to play my Tide, I HATE them. I really don’t hate this guy, because I don’t know him. It’s all in fun. I love College Football because it starts during my favorite time of year, fall and into winter. It may sound weird, but I love this time of year. I couldn’t tell you why. I just do. Don’t worry, I won’t be posting about Alabama every time they play. Unless they make it to the BCS National Championship Game. If that did happen and we won, that would be 3 straight in a row. I’m sure some of you are saying WHO CARES, I do! I won’t continue to bore you with football talk. Overall, today was another great day for the REGULARS.